Shiver me timbers! ‘Tis another little beauty from NetEnt off the starboard bow. By thunder, she’s full of booty too. It’s time to dust off your cutlass and perfect that Keith Richards impression because there's the eerily entertaining Ghost Pirates slot – and its treasure – in sight. Play Ghost Pirates for Real Money! 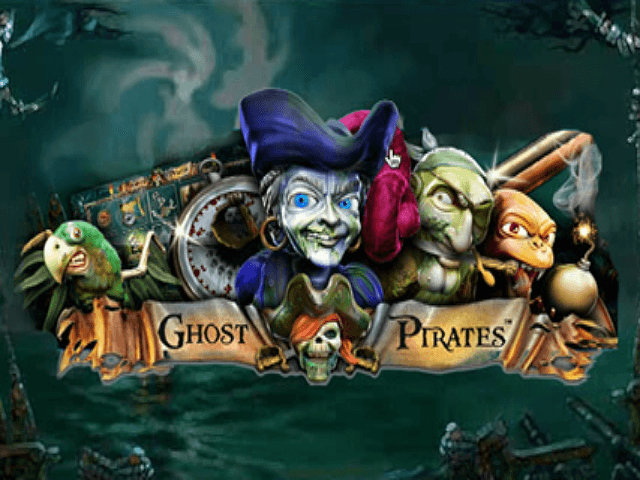 With its ghoulishly good 3D graphics and suitably spooky sound effects, Ghost Pirates is definitely one of NetEnt’s more evocative and haunting offerings. The five reels set in front of a dark, sinister sea (think of those underwater shots from Jaws) is a nice touch, as are the ghostly corsairs loitering at the sides of the screen. Unsettling noises like creaking floorboards and wailing spirits torment you throughout to round off the eerie ambience. Another major highlight is that this title deviates slightly from NetEnt’s tried-and-tested formula by letting you play with win 'ways' instead of traditional win lines. 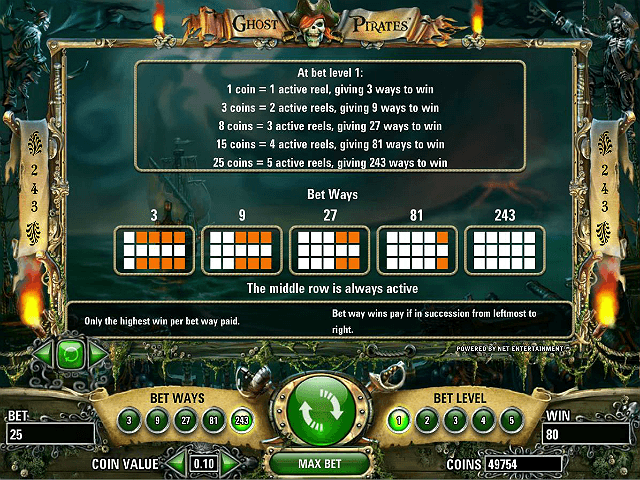 This makes the Ghost Pirates online slot an extra-exciting challenge as it means you can choose from 3, 9, 27, 81 or 243 ways to win. Needless to say, 243 ways to win hordes a pretty handsome treasure chest considering there’s a top prize award of 1,500 coins per line up for grabs. 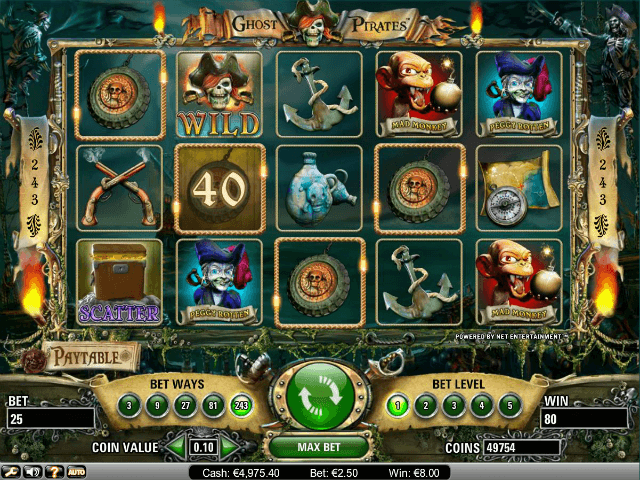 Playing with win ways means the Ghost Pirates slot game console looks a little different to most other NetEnt games. The first thing you have to do is select one of the five pre-set options regarding active paylines. The same goes for your bet level; simply click the level you want to play for from 1-5 to highlight and select. After that, things become more familiar with the trusty left and right arrows on hand to control the coin value from 1p-50p. The full betting range runs from 1p-£62.50, with the greatest rewards reserved for those who choose to play with the full 243 ways to win enabled. It’s fair to say that the 243 win ways are this title’s biggest draw, so bear in mind that there aren’t actually that many other features available. It's left to the free spins game to act as the main source of bonus earnings. This is triggered whenever three or more treasure chest scatter symbols appear in a line, starting from the left-most reel. You can grab up to 20 free spins in general, although this increases to 25 if you play with all 243 ways to win activated. Everything you accumulate with your free spins bonus gets banked via a sweet 3x prize multiplier. Suffice it to say, this can prove to be a very rewarding bonus feature when your luck’s in. The symbols used on Ghost Pirates’ reels represent all kinds of hellishly supernatural characters from Davy Jones’ Locker. Big ticket emblems like Peggy Rotten and One-Eyed Ed are worth keeping tabs on, while icons like smoking pistols, skull vases and cursed pendants offer generally less lucrative rewards. 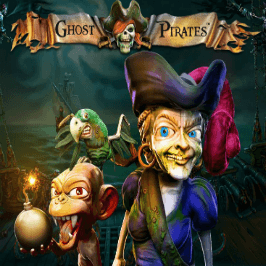 If a moody, pirate-themed slot sounds appealing and you fancy trying something just a little bit different then by all means give the Ghost Pirates slot a go. Even if you’re not won over by the omission of a progressive jackpot, it’s a good bet, as you’ll find the smart visuals, evocative audio and engaging gameplay too enjoyable to resist. Share this Ghost Pirates Review today! 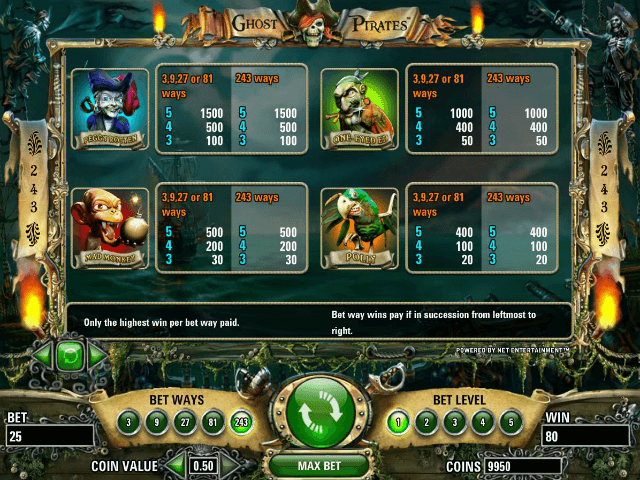 If you like Ghost Pirates, you'll love these slot titles too!